Heifer Tanzania Communications Coordinator Richard Bugaisa contributed to this story. Passing on the Gift doesn't just happen in the villages where Heifer works around the world. It's an idea that also inspires Heifer staff to give of themselves whether it be in time, talent or a physical gift. The staff of Heifer Tanzania recently marked Pass on the Gift month in their own unique way. 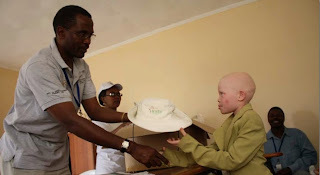 In support of the government's measures to stop the killings, the Heifer Tanzania staff provided educational materials and protective gear to about 56 albino students at the Mukidoma Secondary School in Usa River. Heifer Tanzania Communications Coordinator Richard Bugaisa wrote, "Apart from supporting the governments call to protect albinos, Heifer International Tanzania realized that, since the outbreak of merciless killings, people with albinism especially children have not been able to attend school in fear of their lives." Both institutions agreed that this would be the beginning of a strong relationship. Heifer Tanzania also plans to continue to pass on their gifts to the albino community in the coming years to help end the traditional beliefs about albino people.